www.motoonline.com.au By Alex Gobert Image: Marc Jones Photography. 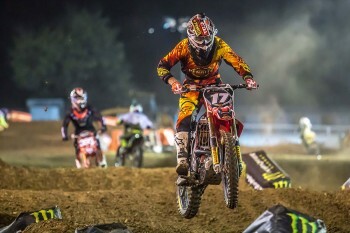 Moss takes the Open, Faith strikes with SX2 win, while McLeary takes SXD overall. Team Motul Suzuki’s Matt Moss made it back-to-back SX1 victories to open the 2014 Penrite Australian Supercross Championship at Bathurst in New South Wales on Saturday night. After dominating Friday’s opening round, Moss was again near untouchable on Saturday, winning both of his heat races in an expanded schedule and comfortably winning the main event. Defending champion Moss won by 4.701s again over Adam Monea (NPS Monster Energy Kawasaki), who in turn was 7.401s ahead of Lawson Bopping (Team Motul Suzuki), who tonight got the better of Kirk Gibbs (KTM Motocross Racing Team) for the final podium slot. Jake Moss (NPS Monster Energy Kawasaki) improved to fifth on Saturday after running as high as third early on, fending off Sam Martin (Suzuki) and teenager Jesse Dobson (KTM Motocross Racing Team) for position. Behind that trio was Kade Mosig (DPH Motorsport Yamaha) in eighth after he too struck trouble in the middle stages, as Daniel McCoy (Honda) and Josh Cachia (Husqvarna Motocross Racing Team) completed the top 10. Cachia was forced to work his way from the rear after an early error. Hard luck story went to former multiple-time champion Jay Marmont (Penrite Honda), who was another to run inside of the podium placings, before dropping down the order with a costly late mistake to finish 12th behind Justin Carafa. In the standings it’s Moss on 70 points, six ahead of the consistent Monea, with Bopping and Gibbs tied for third a further six back in a tight start to the season. In the SX2 division it was American Gavin Faith (Penrite Honda) who rose to the top of the final, taking over from Taylor Potter (Boardstix Motorsport Honda) at the front on lap nine and remaining there for his first win of the season. Faith won by 1.595s over Potter and it was Kale Makeham (Tunetech Racing KTM) who rounded out the podium, holding Friday night winner Brenden Harrison (Instant Security KTM) at bay in the closing stages. Faith now leads the series by two points over Harrison. Like Potter, another Australian returning from the US was Jackson Richardson (Honda) to finish fifth, with Kyle Peters (Wilson MX Honda), Hayden Mellross (Raceline Suzuki), Luke Arbon (SD3 Husqvarna), Nick Sutherland (Raceline Pirelli Suzuki) and Ryan Marmont (Husqvarna Motocross Racing Team) closing out the top 10 results. Last year’s Junior Lites champion Brock McLeary (KTM Newcastle) broke through for his first SXD victory by virtue of 1-2-1 finishes, leading race two winner Dylan Wills (KTM Newcastle) and Tomas Ravenhorst (TR Motorsport KTM) on the podium overall. Round one winner Jack Simpson (Davey Motorsport KTM) was fourth. Meghan Rutledge (Kawasaki) was the class of the Women’s field once again, victorious from Sayaka Kaneshiro (Honda) and Maddison Brown (Yamaha), while in the Junior Lites tonight it was Jordan Hill (Yamaha Junior Racing) who swept all three races to take the overall win ahead of Lachlan Holroyd (Yamaha) and Travis Silk (KTM). The series will now head directly to Phillip Island for rounds three and four next weekend alongside the Australian Motorcycle Grand Prix on 18-19 October.